You have your logo, your company colours, your corporate identity.You know exactly what your brand should stand for and the type of experience you would like your customers to have. You know what your mission, vision and values are, but how do you translate this all of this ideology into actual real, meaningful customer experiences? The answer is through the power of a really great, all encompassing brand strategy. Let’s think about Apple for a moment. Apple’s message is ‘Think Different’ They are all about innovation, sleek design, user friendliness, intuitive technology, simplicity. They weave this message into everything they do, from their packaging to their sleek product styling, their website and especially, one of their most important branding tools – their store design. 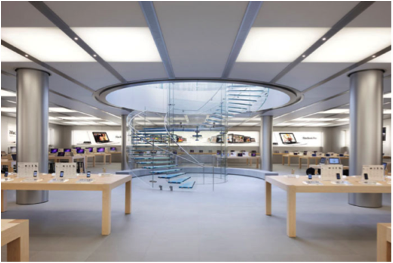 Customers of Apple know exactly what to expect from the brand the moment they walk into one of their ultra-modern, almost space-aged stores. They know that the business is forward thinking, that it is creative, innovative, it has an emphasis on simplicity and clean design. All of this can be seen instantly through the choice of sleek materials, clean lines and neutral colour palette. The fact is that every business’ commercial interior spaces are sending a powerful message to customers. The interior design of a business premises is one of the most powerful images of a business and sends a distinct message to customers about who that business is and how they conduct themselves. With the right commercial designer who understands the mix between branding/corporate identity and great interior design for your business premises, you can exponentially increase the brand awareness, and associations that your customers attach to your business. Why some brands are instantly recognisable whilst others mean nothing! If I asked you to list three instantly recognisable global brands off the top of your head, chances are you would list the likes of Coca-Cola, Apple, IBM, Dell, McDonalds, Virgin, Nike, Red Bull, L’Oreal, and any of the major car brands. Why is that? Is it because they have a distinctive logo? Maybe – but logo means nothing until meaning is attached. Is it because they have a memorable message? That’s probably part of it. Could it be their clever marketing and ability to manage your expectations so that you always have the same experience with them time and time again? Now you’re getting closer to the truth. Mega corporations around the world can, of course, attribute their successes to a number of important factors including innovation, creativity, authenticity and so on, but one of the defining factors that almost always contributes to business success is their ability to define their brand simply and then translate that brand meaning into every touchpoint within their business and this means their websites, their marketing materials and rather importantly, their premises. Successful brands know this and use every opportunity to share their brand meaning with their customers. That means that their brand message is not only communicated in their website and marketing efforts, but also in their place of business. Is your place of business communicating your brand message? Now, for many businesses, their premises is not the first touch point (point of contact) that they have with their customers. More often these days, it is their website. However for many more businesses, their place of business is a hugely influential point of contact and it is one of the best tools they have in their arsenal of marketing tools for communicating exactly what it is they stand for. You see, your business premises, whether it is an office, a retail space, a restaurant etc is a major representation of your brand. It is the physical manifestation of all that your brand represents. If you are a business that ever meets with clients and customers face to face, then the importance of the design of your interior space cannot be underestimated. Ask yourself now – ‘What does my brand stand for’? What do I want my customers to know about my business? What can they expect from me? Is it clear to them? Just like Apple – try to figure out exactly what you want your customers to think about you every time they hear your name. And then look around your place of business and ask yourself – Is my premises really representing me? Is it telling my customers at first glance what I stand for and what they can expect from me? Do my interiors depict quality, prestige, innovation, relaxation, creativity? Whatever it is you want to say to your customers – look for that in your design. If you don’t know what your premises is saying to your customers, have a look at some of our other articles on the Psychology of Colour and The Psychology of Lines, Form and Shape or browse some of our examples from past projects here.